I like to buy good quality tools. Tools that will last and I can trust. Nothing worse then working on a one of a kind project and because of a cheap tool you will get some marks, scratches or other mistakes as a result! Therefore I need to look for some other brands I can trust. I use them almost every day in our shop. And they are still going strong! So today I went there and picked up 10 of them. A couple more, but different lengths, tomorrow. What type of clamps are you using? Any recommendations? Build your own? The next clamps you should buy are Craig's Bowlamps. Especially good if you have a limited supply of clamps. 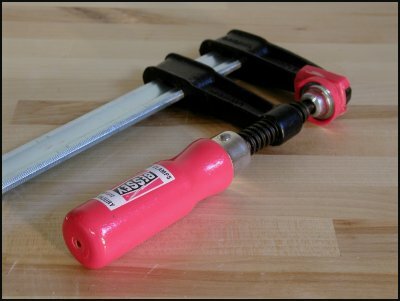 I like the strength and simplicity of the Bessey Tradesman. Below is the newer larger style. I agree with Michael, order the bow-clamps. and with Mirko, stay away form the junk. I know alot of us do this but isnt it a bit dishonest? Are they really going to save 3 hours of clamping time on a project? Maybe spread it out over 2 to 3 projects as to not penalize that lucky client for having picked you in a time of bowclamp need. There's nothing wrong with adding misc tool costs to a project. Whether it's a special router bit that one has made for a specific project, or the cost of a special jig that you may or may not use in the future. If you need a specific tool for a project and you leave room in your budget it is not dishonest. Then again I'm talking about bidding out on projects, not working on time and materials, that's a different matter and then you would be correct. .....and 99.9 percent of the time bided projects always seem to take longer, so it all balances out in the long run. Last edited by RogerSavatteri; 10-28-2009 at 08:49 AM. My experience is from a different world and it is absolutely common to figure in (perishable and special) tooling costs when quoting work. It's the only way you are going to make money if you get the job. Even on time & material jobs as long as you make the job requirements clear up front. I watch for sales on Bessey Revos and Tradesman clamps & add a couple to my collection now and then. The BowClamps are on my wish list which I should move them up the list because they reduce clamp requirements. At some point I intend to build a set of the "York" clamps for glue-ups (Okamisan recommended). I did a site search -- Canadian Tire does also sell tires. Bow clamps are a nice idea if you are gluing up panels. I'm not doing that too often. I usually only need clamps to assist in assembling cabinets and bed frames. Therefore, they are too limited in their use for me. I totally agree, stay away from crap. But these clamps are really not bad! As I said before, I used some of them almost every day in our shop and they are still working great! Mirko: I will see if anyone in Victoria has the pony brand. Thanks for the tip.